I had a tac-sol barrel on my 10-22 that was built like this. Alum over SS. Seemed to work well. I hope that in the future you will be able to publish additional detail on the method of assembly. Since aluminum expands faster than steel as it warms, this might tend to loosen the fit between the two sections. The Lewis Light Machine Gun employed an aluminum cooling radiator around the barrel, even incorporating fins to aid heat dissipation. Most experts agree, and my own experience confirms, that it did little or nothing that a bare barrel would not. These schemes always sound good but just don’t seem to work in practice. Josh may be onto something regarding differential thermal expansion. The more rapidly expanding aluminum may separate minutely along the interface, creating a thermal discontinuity. I’d like to see some actual long string shot targets to see how accuracy is along with any kind of vertical dispersion. the aluminium sleeve would undoubtebly be alloy, without knowing the exact making up expansion is hard to judge. Josh – The coefficient of thermal expansion for aluminium alloy is about 22 and steel between 10 and 18, if anything the effect of the higher thermal expansion ratio for aluminium alloy would result in the tightening of the fit between the two metal alloys. The expansion is in three dimensions remember, so for a tube this would result in the outer diameter increasing, and the inner diameter reducing, compressing the inner steel liner. Aluminum sheds heat so much faster than stainless steel that it would always be cooler than the stainless steel liner, the liner being the source of the thermal energy. This would tend to offset the fact that aluminum expands more at a given temperature than steel. As to the outer aluminum tube expanding inwards … I believe this is incorrect. I have personally heated pulleys to slip them over a shaft. The inner hole expands when heated. You boys need to review your thermodynamics texts. Only Robert got the expansion correct. Steve, you are quite right, for starting tubes 10 mm in diamter changing from 20 to 120°C, the aluminium would expand to 10.0222 mm and the steel to 10.0173 mm, so a gap of 0.0049 mm (0.2 mils). Not much of a change, but a change none the less. Don’t know what I was thinking of? I live in Columbus Ga. where it gets real hot. Here’s a tip to keep the heat down, just slide a copper pipe over that barrel melt some aluminum pour that into the pipe. Your good to go just saved you alot of $$$. Find another expert; there’s not going to be any useful improvement in heat dissipation. Yes aluminum conducts heat better than stainless – but it’s not the thermal conductivity of the barrel metal that is limiting the cooling rate. The limiting factor is the thermal conductivity of the air layer/film surrounding the barrel (it is a *much* poorer conductor of heat than stainless) – and this is unchanged. EDITOR: Some points. The air layer is not static, but moves over and around the barrel and is essentially infinite. Two, if what you say is correct, then why are heat sinks most often made from aluminum: “The most common heat sink materials are aluminium alloys. Aluminium alloy 1050A has one of the higher thermal conductivity values at 229 W/m•K but is mechanically soft. Aluminium alloys 6061 and 6063 are commonly used, with thermal conductivity values of 166 and 201 W/m•K, respectively.” Wiki. If you doubt that aluminum disperses heat more quickly, you can do your own experiment with cast iron and aluminum cookware. Any cook knows the answer to that one. Also, if the air layer’s thermal conductivity was the only limiting factor in heat dispersion then why do we even bother to insulate heating and cooling pipes at all? Likewise, if a metal’s thermal conductivity is irrelevant, then why do engine builders carefully select materials for radiators, engine fins, cooling lines etc. based on heat-dispersing properties (along with other factors). Steve re read. I am stating that as per robs experience with pulleys, the alu sheath will need to be bought to high heat before the clearance is sufficient for press fitting. the hole will enlarge when heated… and shrink when cooled. 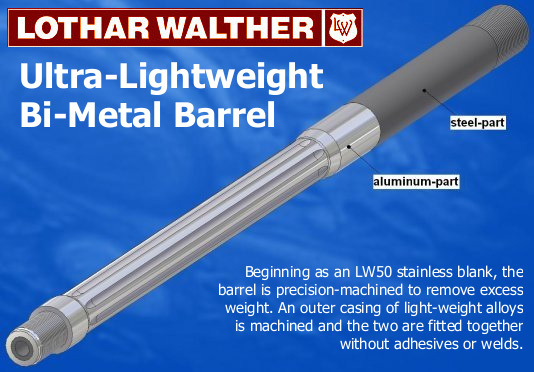 the complete process may likely involve cryo treatment of the barrel liner also. The reason heat sinks are made from aluminum is that copper is expensive and gold is even more expensive. Heat sinks are shaped to present more surface area than the heat source to which they are attached. An aluminum barrel jacket of equal diameter to a homogeneous steel barrel will not transfer heat to the surrounding air any faster. It is limited by the air’s conductivity. Heat is simply trying to achieve equilibrium. When the barrel is hotter than the surrounding air, it will transfer heat to the air until they are the same temperature. Aluminum will transport the heat more quickly and the steel-aluminum barrel assembly will achieve stability faster but the barrel assembly will not lose heat to the air more quickly. Again, these schemes have been tried many times and simply do not provide a worthwhile benefit. Take a look at a Lewis Light Machine Gun barrel. It has large fins and many times the surface area of a conventional barrel and it did not appreciably improve the sustained fire rate. If it worked well, we would see many machine guns with finned, aluminum barrel jackets. Other than the Lewis, how many are there? I’d certainly consider one for hunting…like a 16.5″ barrel on an action I could drop into a chassis stock when not shooting long distance.The weight savings would be attractive. Forget fluting – it`s only for optic. The Aluminium tube must be glued to the barrel with loctite – than it works well.